Spontaneously throughout the Summit for Human Potential Realisation, a Symphony of Energy has come into being. Not once. Not twice. Many times. All Symphonies totally unique, never to be repeated again. Someone starts to hum. Or sing. Or ding a spoon against a glass. A clap of hands, the stomp of a foot. One by one, souls join in. Adding their own tune, tone, rhythm, movement to the symphony. Expanding it. Turning it into something more, something else. Transforming it. Enriching it. There are no rights or wrong, there just is, what is. Nothing more. Nothing else. And yet, in the moment of collective cocreation of a Symphony of Energy, there is everything. The entire universe condenses into the space opening up to it, held within the dancing humming singing clapping energy, like a group of young children happily bouncing about on a flowering field in summer, laughing, skipping, doing cart-wheels and clapping hands, peals of laughter and excited shouts of joy filling the air waves. ”Sorry, too busy living life to pose for you, and by the way I see my friend over there!”, said the Peacock, dancing away on the castle grounds. It’s one of the strongest sensations I bring with me as I head home after the close of the summit, this amazing feeling of co-creating a symphony of energy together with others. Amazing. All made possible out of the generosity and willingness of individuals to surrender, collectively, to what wants to happen, in the here and the now. To dance and play, to live, to love, to be. I’m sitting here writing this, remembering, feeling the Symphony of Energy within me, the memory resided in me, fully, in Body, Mind and Soul alike. Tears well up in my eyes, gratitude pulses through me. The feeling that comes to me, strongly, enforcing its message, shouting out loud, proud and happy. * Fuel units – that’s what Tai calls money. Fuel units. If you have a car, you need fuel units to make it move. Same goes with everything else. We need fuel units to make things happen in the world, and with them you can do good, just as you can do evil. But since the golden circle (our Why) for me and Ulf is ”to make the world a little better”, we’re opting for doing good. As someone deeply engaged in creating a better world, a sustainable learning society, this quote really hit me heard. Because this is exactly what I believe. It is so vital to take a long good look at what we are doing right now, in the present moment. If it doesn’t resemble the future we dream of – why, then we should stop immediately and ask ourselves Why? Why doesn’t the present look like what I’m dreaming of? What I’ve discovered since initiating the #skolvåren-movement (aka the school spring) is that many people actually lack a dream of the future. Their image of the future is simply ‘more of what we have today’, and they cannot fathom something else. For me – that implies that they have lost the ability to dream. For me – that implies that we are at our societal peak, i.e. this is as good as it gets, and society cannot become better than its current set up. For me – that’s not good enough. my eyes an think ahead – I can awaken the feeling I want to have, from the settings of a sustainable learning society. And you know what? I think that’s sufficient in and of itself! I don’t need to know the What and How of the future, not yet. Because, if my Why if strong enough / the What and How will fall in place. I go one step at a time, and each step will bring me closer to the feeling I am striving towards. 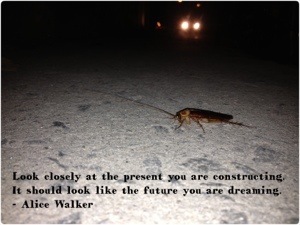 So, look closely at the present you are constructing. It should look like the future you are dreaming.